The SoloCinema Studio offers shallow depth for today's ultra-thin TVs, a sleek, minimalist appearance, an exquisite attention to fit and finish and of course exhilarating sound. But just when you think you've hear it all, the Studio offers an additional audio feature and even more ease and convenience when it comes to setup. The Studio's sound bar, powerful wireless subwoofer, and ergonomic remote deliver an immersive 5.1 channel listening experience. The soundbar also features bluetooth with apt-X and AAC for CD-quality music streaming, plus NFC connectivity for the ultimate in pairing and connecting ease for enabled devices. And while it can be wall-mounted, the Studio offers location that options to sit on a shelf under the flat screen or, raised above a protruding TV table stand. SoloCinema Studio features five discrete channels, high performance speaker elements for each channel and 120 watts of power complemented by a 200-watt wireless subwoofer. The bar comes equipped with convenient, high performance HDMI inputs, Bluetooth wireless audio, and true 5.1-channel DTS and Dolby® surround processing. Definitive’s proprietary Spatial Array technology frees sound from the enclosure to envelope you in a totally enveloping life-like sound – without the clutter and hassles of five speakers. The compact wireless subwoofer creates waves of big bass via its downward firing 8-inch woofer, bass port and robust 200 Watt amplifier. The system comes out of the carton with the subwoofer already paired to the bar. 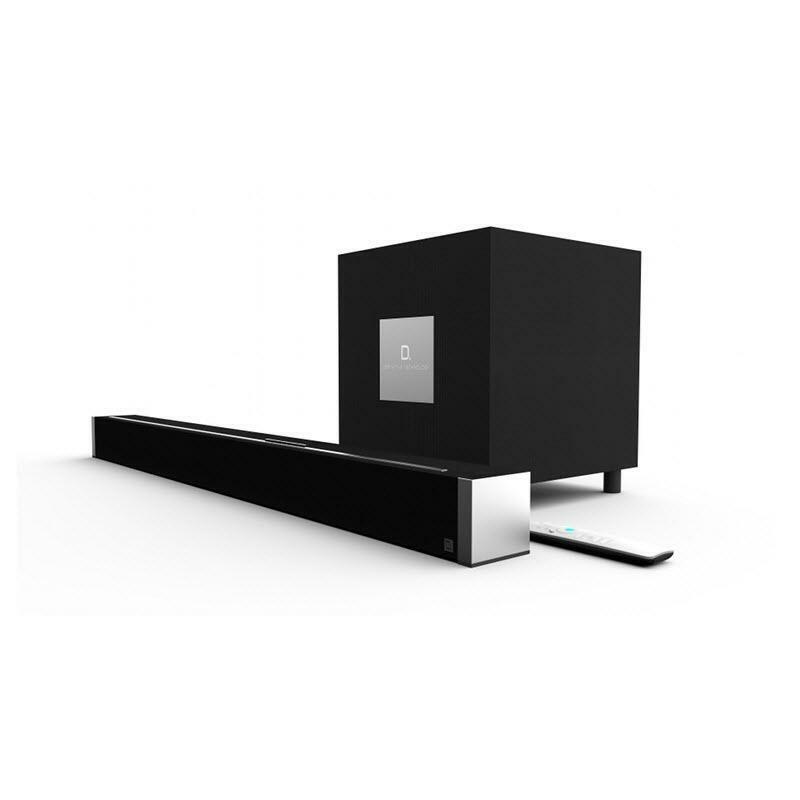 The appeal of this product goes far beyond superior power and sound, which is why the SoloCinema Studio entices with its clean contemporary design and convenient dimensions: 43" wide and barely over 3.0" deep. The SoloCinema Studio will be a popular choice for anyone who wants a clean appearance to complement a contemporary home interior. The SoloCinema Studio's design theme complements today’s flat panel TVs, and so do its mounting options. 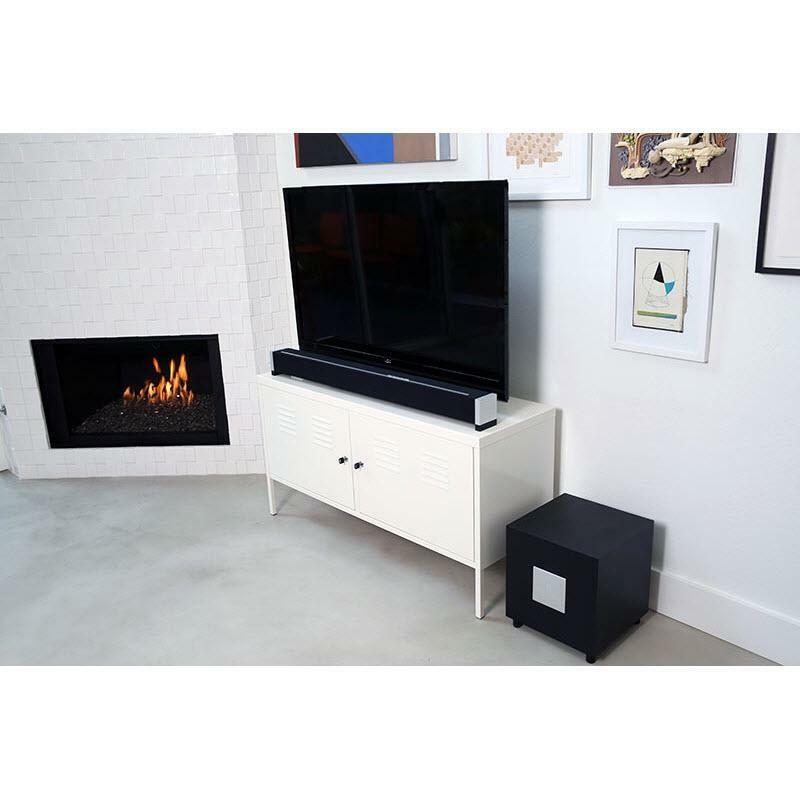 Supplied hardware (feet and brackets) enable the sound bar to be placed in one of three places: on a shelf under the flat screen and, raised above a protruding TV table stand, or mounted on a wall. Supplied magnetic riser feet enable you to customize the SoloCinema Studio’s height to clear the TV’s IR sensor. 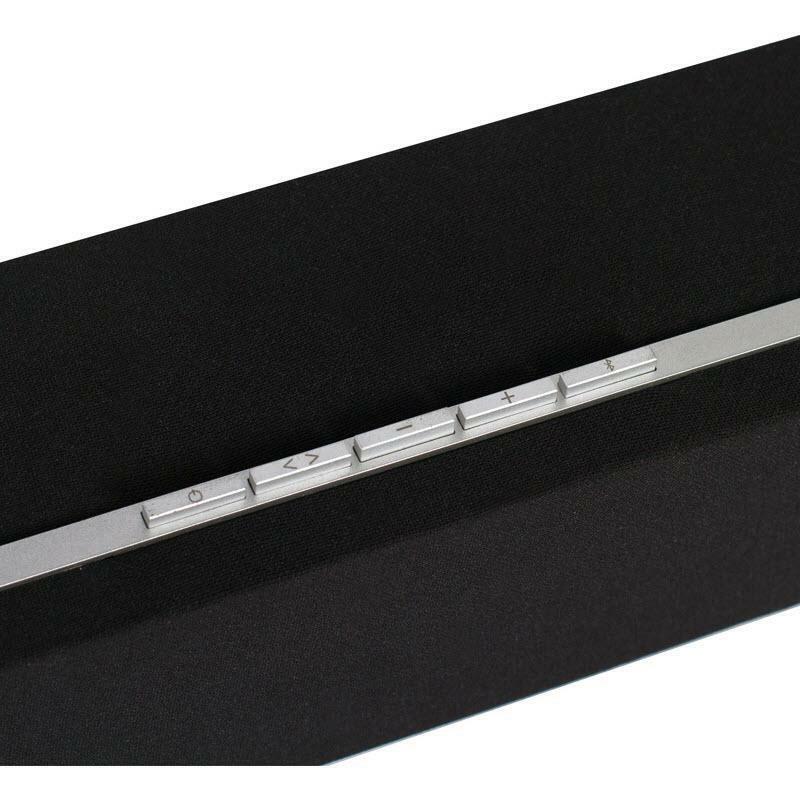 If you prefer to wall mount the sound bar, it has built-in keyhole slots. Definitive Technology is America’s leading high-end component loudspeaker brand. When it came to designing a sound bar system, the SoloCinema Studio continues our heritage of precision sound. 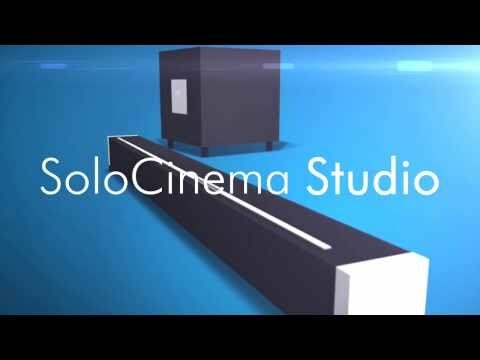 The SoloCinema Studio's acoustic and electronics systems are of the finest quality and based on our decades of experience designing cutting-edge high performance audio products. Each driver and tweeter in the bar is powered by its own digital amplifier; in total 120 Watts powers the bar to thrilling volume levels capable of filling large rooms with high-impact, low-distortion sound. There are no passive filters or crossovers—all signal processing is performed digitally for the utmost precision, clarity and accuracy. Despite its small size, the Studio's wireless powered subwoofer unleashes big gutsy bass. Its eight-inch high excursion woofer is powered by a massive 200 Watt digital amplifier to provide you with all the impact you want from your favorite music and action/adventure films. The subwoofer connects to the bar wirelessly. Select the location that best fits your lifestyle and decor, plug it into a wall AC outlet and you’re ready to rock. The subwoofer's unobtrusive cube form factor tucks out of the way behind furniture. 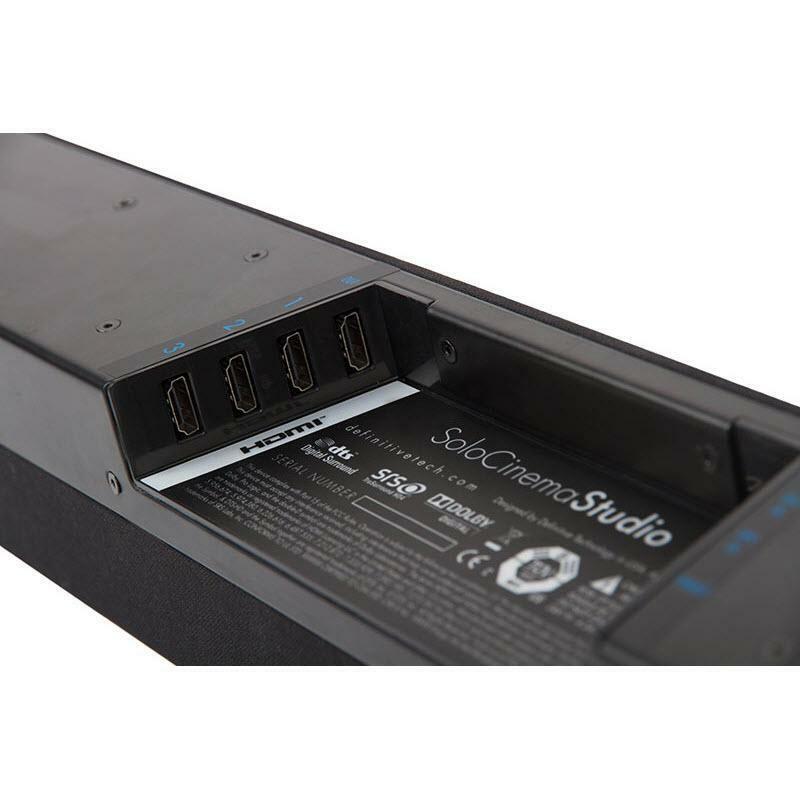 SoloCinema Studio has a full array of inputs including HDMI, digital optical, and analog allowing you to connect your Blu-Ray player, cable/satellite tuner, gaming console as well as a legacy source such as a VCR. HDMI inputs means connecting your HDMI-equipped sources and TV is easy—each HDMI cable carries both audio and video signals for convenient hookup and neat wire management. 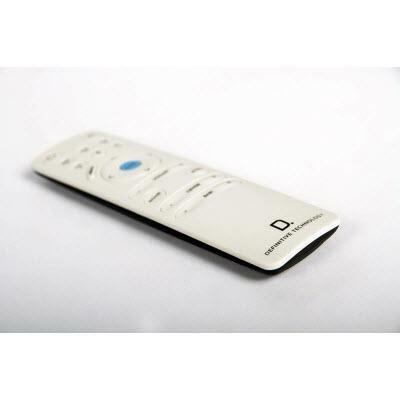 SoloCinema puts you in control, simply and comfortably with its ingenious remote. Most complicated component audio systems can’t give you that kind of control. As you slide your finger over the remote you’ll notice that all the controls are shaped with concave and convex forms. This is one remote you’ll be able to navigate in the dark. Easy. It fits perfectly in your hand, your thumb naturally falling on the most often used control – Volume. Nearby is the Bass control—now you can optimize bass loudness to match the program material, your taste or your mood, all in real time without having to move out of your chair.